You will learn various systems for remembering strings of numbers, lists, facts, scripts, speeches, presentations and more. Includes our Spaced Repetition study method and Info-Mapping technique. Who would benefit? Anyone needing instant and accurate recall of account numbers, telephone numbers, coding, pin numbers, and all of the above. Course Length: As long as you need, 24/7. Whatever you need to remember, we have techniques to help. Amazingly, these techniques are easy to learn and work brilliantly! SuperReading is a comprehensive course which provides the tools for absorbing and retaining large amounts of information in less time. Work-related materials may be read in class. You will experience a steady improvement in your reading and learning abilities. Testing provides measurable proof of the upward trend of your improvement. Graduates agree that reading is more enjoyable, as well as more efficient with these powerful, yet easy-to-learn techniques. Guaranteed to at least double incoming abilities. SuperReading is NOT SPEED READING. 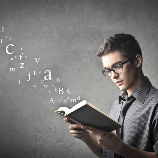 These skills take you FAR BEYOND traditional speed reading. Research shows us that skills like these, though simple to understand, take time to embody and use consistently (weeks). SuperReading is a sensible, practical program that is EASY TO LEARN and shows QUICK RESULTS. There’s a complete testing package so you always know where you stand. Also, you get The Rep Test. This five-minute exercise tells you what kind of learner you are (Visual, Auditory, or Kinaesthetic; or combination) AND comes with a training package to improve all of those areas. We focus mostly on Comprehension and Accuracy. The speed is there, but what good is speed if you don’t recall what you read? QUESTION: Did you ever get to the end of reading something, and discover that you remember almost nothing of what you just read?! With SuperReading, after the first couple of days, that will virtually never happen again. What is that, alone, worth to you? We Guarantee you will more than double your present abilities. Most people see a three to five fold increase in six to twelve weeks. Business professionals (Managers, Engineers, Scientists, Admins), Government Employees, Salesmen, Students, Entrepreneurs who read at least 4 hours per week (emails, memos, reports, journals, correspondence, classes). Allows more time for starting (and finishing) projects. Dyslexic readers get tremendous benefit from SuperReading. Learn all the latest and greatest techniques and tools for setting meaningful, exciting goals. You will learn how to achieve those goals! This program is filled with amazing insights and exercises to understand yourself and gain a more balanced life. You will learn important techniques for “getting out of your own way”. Have you heard about visualization? We’ll teach you how to be a Master! 25 years of research and working with thousands of people has resulted in this unique collection of knowledge, tools and techniques. Who would benefit? Anyone needing to get more from life, work and everything else. Whatever you need to achieve, we have techniques to get you there. These techniques are easy to learn and work brilliantly when applied consistently. If interested we have also included“Co-Creative Thinking” techniques. Some people consider this a more “spiritual” approach, akin to concepts revealed in “The Secret” and other similar works. These tools are very powerful, but we understand that not everyone is prepared for such information. If it’s not your cup of tea, then you may skip that section. Includes many stress reduction techniques as well. Who would benefit? Anyone needing to get on track with their time. 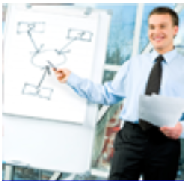 You will learn how to put together effective presentations and deliver your message with appropriate power and result. We cover everything from how to stand, use a podium, PowerPoint, eye contact, seating arrangements, working with large audiences, making your point, handling nerves, handouts, taking questions and a number of strategies for delivering a memorable, informative presentation. Who would benefit? Anyone needing to make a strong impression when presenting to groups or individuals. Those who have fear when presenting before a group of people, from five to five hundred. “I am the Senior Engineer of Apple Computer’s Global Response Team. The SuperReading course has helped us to more than quadruple our productivity. Thank you for offering such a useful tool which has made our jobs so much more fulfilling." Thank you for working with my group. The skills you taught helped us pull off a small miracle that saved the company a major client worth 21% of our business. There were 13 teams working on the solution, and we had the fewest people and the least amount of technical expertise. Against the odds, we were not only the one team that came up with a viable solution, but we did it two weeks ahead of the deadline! “I was a bundle of fear before this class. We had to give a 3 minute speech about ourselves, and after 30 seconds I burst into tears and had to sit down. Now it’s five months later and I’ve become our company spokesperson. Nobody can believe the difference! I’ve been promoted twice since then. How can I ever thank you enough? You created a safe place to learn and practice. That made a lot of difference. Thank you. The basics of good negotiation are covered in this course, along with some nuances not always associated with negotiation. Not only will you learn WHAT to do, but what to avoid AND what to watch out for from your counterpart. We’ve taken “Win-Win” to a new level. This course includes pertinent information on goal achievement and NLP, including tips on persuasion, body language, communication and goal setting. We’ve tried to put together a more holistic approach to meaningful, productive negotiation. The thrust of the techniques are to build relationships, trust, and make the entire process more conducive to ethical business practices. Are you selling products or services? We’ve combined goal achievement with selling for a winning combination. Learn everything from building rapport to handshaking to closing techniques. If you are in sales, these ideas are worth thousands and thousands to you. Maybe more. Who would benefit? Anyone needing to get more from their sales efforts. Suggestion: The Goal Achievement course is a brilliant adjunct, as the two have some worthwhile overlap. Your help with my sales training has been invaluable. I don’t even know where to start in explaining the impact this has had for me. Before we worked together I was unfocused, unmotivated and operating in a non-productive manner. I’m following the “Recipe for Success” every day and the rewards are mounting up. My treasure map has been fulfilled and we’re having to hire more people as a result of my success. I’m getting bigger clients and we’re making greater profit. All the things I’ve been doing to re-program myself are paying off! How can I ever thank you? I can’t, really. So, thanks a million will have to do! Robert May, Senior Sales Manager, NetMagic, Inc. Learn strategies and specifics for writing effective reports that get read and invite action. Numerous exercises hone drafting, writing and editing skills. This unique multi-stage writing process saves time and results in clear, concise communication. Surprisingly, the multi-stage approach saves time, reduces stress and results in more effective text. We invite you to send in samples from reports you have done for comment. Amazingly, we often see a reduction in total words used from 50 to 65%. In one particular class in 2013, a delegate did a “before and after” word count, and had reduced his report to exactly one third of its original length! Who would benefit? Anyone getting negative or neutral feedback on their written reports. Those who need to stop waffling and get to the point. These courses are available for individuals as self-paced learning tools. All online courses are supported through Email, Skype or Phone for any questions. Would you like your holiday snaps to look more like a professional photographer took them? These basic secrets of what makes an intriguing photograph are SO easy to learn and apply. More and more of your photos will have that “certain something” that makes them capture the viewer’s interest. Knowing and applying these “rules” will transform your photos into more of an art form. Put them in a frame on your wall and people will ask you who took them! You will also be bale to take old photos and “crop” them to make them look much better. Who would benefit? Anyone wanting to ooh and ahh over their photos - or wanting someone else to! “My but these techniques work! Some of my pictures are so much better than anything I’ve ever taken before. My friends are impressed as well. And the cropping advice brought many of my previous shots back to life! If you know the basic rules and techniques of a sport, this course will propel you into higher achievement than you’ve imagined. You will totally outperform yourself and most any competitor. Whether your sport is contact or non-contact, competitive or non-competitive, if there is ANY room for improvement, you will be amazed at how quickly you can surpass even your best day or effort. In The Zone? You will REDEFINE The Zone! Includes information on goal achievement as well as specific techniques for 16 different sports. Whatever sport you are interested in, if it not one of the 16 covered, no worries! By the time you’ve read three or four examples, you will fully understand the PRINCIPLE behind the program, which will allow you to easily adapt the ideas to ANY sport you are interested in. This same principle can be applied to other activities, like meetings or any kind of performance. The principle is also brilliant for overcoming fears. Who would benefit? Anyone who wants to outperform anything they’ve done before in sports. This is to thank you for the amazing skills you taught me a couple of weeks ago. You had noticed in class that I seemed a bit “preoccupied.” After the class we talked and I told you that I was worried about tomorrow’s game going into the quarter finals. The coach chose me to start as the team’s pitcher. Normally I would have been really excited, except that my pitching has been awful the last few days. You taught me those visualizing skills and I used them just before I went out there. It was miraculous! I pitched my first ever no-hitter game. My coach was astounded, as were my teammates. We went into the semi-finals and when my turn came up again I used the techniques and pitched a one-hitter game, which is still fantastic. We are heading into the finals now and I can’t wait.